The San Leandro City Council voted 5-1 in favor of a proposal to build a 100-foot-tall wind turbine on the city’s shoreline that would benefit one business. Residents at the nearby Heron Bay housing development are weighing their next moves, which could include a lawsuit. The city’s Board of Zoning and Adjustments approved the plan on February 7 by San Leandro wind turbine manufacturer Halus Power Systems to erect the monopole for both research and development and for defraying energy costs at the ten-employee company. Homeowners at the shoreline residential community, however, raised doubts over the findings of a study by the city that found the wind turbine posed no significant impact on the environment. The same group has repeatedly urged the owner and the city to perform a more rigorous and costly environmental impact report to further study the issue. But city staffers said opponents of the wind turbine continually failed to present scientifically verifiable evidence for their assertions that the turbine would greatly harm birds, including some nearby endangered clapper species, or prove that it posed potential health concerns for residents — some as close as 300 feet from the proposed turbine. “That’s all we want to put up.” Nevertheless, Cassidy added an amendment to the motion that would bar additional wind turbines on the Halus property. The wind turbine controversy has become an unlikely nexus for two competing visions for San Leandro — one that strives to maintain a reputation as a quiet, relatively safe bedroom community, versus a vision of the former factory town growing into a 21st century hub of green-tech innovation. The city’s initial exuberance to add Halus and its wind turbine company to the list of green tech firms may have put the proposal on an early turbulent path. 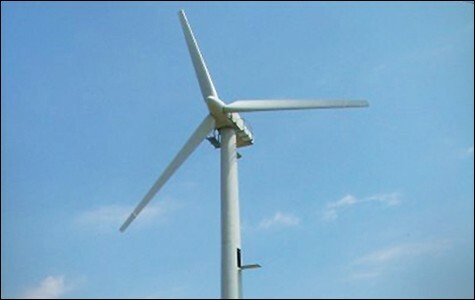 Last June, Heron Bay residents said they were blindsided by a relatively unpublicized announcement asking for public input over the wind turbine proposal. However, the city, citing the bare minimum, notified homeowners within a 300-foot radius of the proposed monopole, which encompassed less than a dozen homes on the southwestern edge of the Heron Bay community. In addition, news of the proposal only became widespread among Heron Bay residents just days before the end of the 30-day public comment period. The public relations snafu alienated many residents who believe the city was intent on pushing through the proposal without consulting with the public. Councilmember Ursula Reed, who registered the only no vote Monday night, faulted city staff for not offering information about the proposal to the development’s large number of Asian Americans, estimated to make up 75 percent of the community’s 1,500 residents, and some of whom possess limited proficiency in English. “A majority of residents in Heron Bay speak Mandarin or Cantonese,” said Reed. “I think not having information in those languages could have aided in that confusion in that community.” Councilmember Benny Lee, who represents Heron Bay in District 4, recused himself from the discussion. Lee is a former Heron Bay HOA president who had led the early opposition to the Halus wind turbine proposal before being elected to the council last November.